Bring a little vroom into your life. 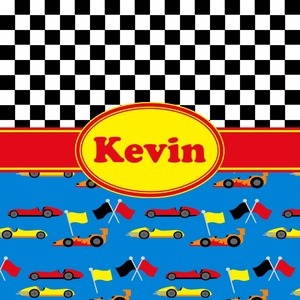 This design is perfect for the future Nascar driver or any one who loves racing cars! The top of this design is the classic black and white checks. The bottom half of this pattern screams drag racing with cars in red, yellow and orange interspersed with racing flags on a blue background. A yellow trimmed red ribbon and a yellow oval label tie the design together. Personalized with the name of your choice will bring a smile to your racer.